Exactly thirty years ago something happened which altered the course of history in Sri Lanka. Wrong. ‘Happened’ is a bad word for it implies an agency-less occurrence. It’s like saying ‘it rained yesterday,’ which of course is different from ‘there was a flood’ since the latter phenomenon at least in the case of Sri Lanka over the past few days can be directly linked to human arrogance, ignorance and rank stupidity. Something was done, then. Thirty years ago. Does anyone remember? Perhaps not. I did not remember either; not until Jayasuriya Wijedasa sent me a cryptic email under the following subject line: First invasion of independent Sri Lanka 4th June 1987. And this is what he wrote: 30th anniversary in 5 days… Hope you are planning to highlight this tragedy and ensuing calamity to us.” Clicked. Had to be what has since come to be known as the Parippu Drop”. We have better recollections of the 29th of July, 1987 because that’s when Rajiv Gandhi and J.R. Jayewardene signed the infamous Indo-Lanka Accord. We know of the ‘first invasion’ but few would remember the date. Operation Poomalai, as it was called, is something we should not forget, though. The Indian Air Force airdropped 25 tons of food and medicine into areas held by the LTTE at a point when the security forces had essentially corralled the terrorist outfit in Vadamaarachchi. It could be called the Nandikadal of 1987 and to ascertain the significance of that lost opportunity all we need to do is to take note of the gains of defeating the LTTE 22 years later. Let’s first do that. There will be those who claim that ‘the problem’ is still unresolved. There’s some truth in this. The demands made by Tamil nationalists (and chauvinists) are still out there. ‘Normalcy’ is yet to be obtained. Then again we are talking of a 30 year war and one which exacerbated mutual mistrust among communities, caution on the part of successive governments given that close friends and indeed former members of the LTTE are using the very same rhetoric of that outfit. On the other hand, one could argue that things are no better and no worse than they were, say, before 1977 and the Batakotte (Vadukoddai) Resolution of the TULF in the seventies. However, if we take May 18, 2009 as a point of reference, we have to acknowledge the following: a) no war, b) no abduction of children and forced conscription, c) no terrorist attacks, d) no Tamil politician enslaved by the LTTE, e) no threat of hostage-taking for purposes of creating human shields, f) no major obstacles for people to engage in livelihoods, g) no waylaying of supplies. June 4, 1987. Historic for all the bad reasons. That nevertheless was a landmark but not necessarily the beginning. India’s direct and indirect support of the LTTE from arming to funding and training insurgents predates 1987 and is well documented. The Parippu Drop precipitated the dumping of the Indo-Lanka Accord and with it the conferring of a certain respectability to the myth of a ‘historical homeland’ with well-demarcated boundaries. Tamil nationalism is still squeezing juice of that particular rotten orange. The Indo-Lanka Accord allows India (and others) to keep harping about the 13th Amendment as though it was cast in stone when in fact it was obtained through an agreement which was observed in the breach, india being the major transgressor. India agreed, for example, to oversee the surrender of arms by all militant groups. We know what happened. Quite interestingly (and this I chanced upon only a few minutes ago), the Accord has this: These proposals are conditional to an acceptance of the proposals negotiated from 4.5.1986 to 19.12.1986.” In other words, ‘July 29, 1987’ was in the making from May 4, 1986! What these ‘proposals’ are weren’t mentioned in the agreement. India embarrassed itself in Sri Lanka. First of all, the reasons offered were ridiculous. Twenty five tons was just not enough to feed a ‘starving’ population. The ‘hurt’ of Tamil brethren in India being the prompt was as silly an excuse as any. There would have been more people starving in Tamil Nadu on June 4, 1987 than in Vadamaarachchi or in the entire Jaffna Peninsula, I am willing to wager. In any event, India helped create the conditions for the operation that the Parippu Drop was designed to stop and therefore the moralizing was melodramatic and little else. The Parippu Drop was followed by the Indo-Lanka Accord and that brought the IPKF to Sri Lanka. It would be good to recall that less than three months later, on October 21and 22, 1987, the Indian Army entered the premises of the Jaffna Teaching Hospital in Jaffna and killed between 60-70 patients and staff. One can’t draw a straight line from June 4 to October 21 and 22 of course, but there are things we know which force us to conclude that India was bad news back then. We know that Rajiv Gandhi described the process as ‘the beginning of the Bhutanization of Sri Lanka’. We know that for India, it was a coup (and this too has been admitted) to get the LTTE to agree that Trincomalee would be the capital of the merged Northern and Eastern provinces. Admittedly, India has helped Sri Lanka on occasion but probably not due to ‘lessons learned’. India sent three ships filled with relief items for flood victims. India, according to some, helped the Government by sharing intelligence on the LTTE during the last stages of the war. Some would argue that India’s interventions cushioned some of the blows aimed at Sri Lanka by the USA and the European Union. These are initiatives that are not uncommon. 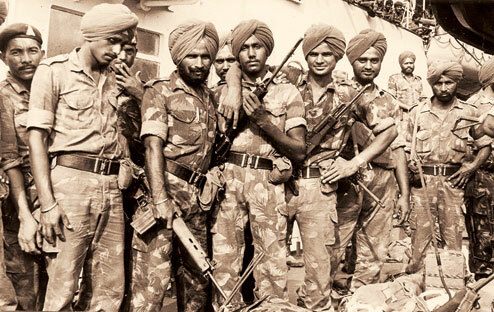 There have been times, we must not forget, when India zipped-up when Sri Lanka needed military help whereas Pakistan responded immediately. Today, India appears to have dropped the kind of schoolmarmish devolution rhetoric that was a staple for Indian diplomats and foreign ministers for more than two decades. Nevertheless, India has not called for the scrapping of the 13th Amendment. It is pertinent to point out here that Col. R. Hariharan, Head of Intelligence, IPKF, openly admitted ‘The Accord retains the potential as an instrument of Indian influence in the region’. This he said five years ago. He is correct. We have to keep in mind that through it all, i.e. the friendship-claim, largesse-show and other such tokenism, India has insisted that Sri Lanka play within the parameters of ‘Indian Interests’. Not that it is wrong because that’s what countries do. However, for all the history associated with June 4, 1987 (and that includes the before and after), Sri Lanka should never drop her guard not least of all because India would not drop her guard either (although she shot herself in the foot with unpardonable incompetence with respect to reading the LTTE between 1987 and 1990). There’s a simple reason: Parippu is being dropped even now, except it is being called different names. And not just by India, of course. This article was first published by Colombo Telegraph on June 4, 2017.